Just Because You Have It, Doesn't Mean You Know How To Use It. The Magician. In Tarot, the Major Arcana Card Suite is referred to as The Fools Journey. There are 22 cards and each tells an important chapter in the tale of life. The reason the Tarot is such an accurate divining tool is because the cards are allegorical of this pilgrimage that we’re all on. Each speaks of a different chapter in the journey. Of course our personal realities seem quite different from others, but the struggles are the same. The Magician arrives as card 2, so his lessons come relatively early in the game. His message is that we create our own reality and he advises us to act consciously. He reminds us too, of our abilities to experience power and to create magic. We’re given the tools we need early in our lives. 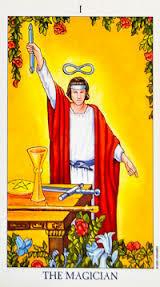 Look to the imagery here and you’ll see that he holds a relic from all 4 of the card suites, meaning he has tools to help manage emotions, utilize mental acuity, create action and manifest abundance. He also wields the gift of time (noted by the infinity symbol in his head). We are allocated our “magic wants” (or tools) upon birth and then must spend the rest of our lives learning how to use them and make them function properly. Like any special powers though, just because we possess them, doesn't mean we know inherently how to make them work. So we must experience adventure and love, heartbreak and lack, and through these adventures, we learn how to use our magic. If you're reading this, you're likely working with a magic wand of your own that’s ready to teach you what it knows. This tool is no doubt asking to be used for the greater good of your personal journey and that of the collective. What is it? What information are you being pushed to absorb and utilize? Can you read energy? Receive messages from beyond? Have the ability to love so deeply that others can take solace from its power? Spread your wisdom to the masses? What is it? Let that be your goal for the week. Name that power and seek the lessons you needin order to be able to use it and get good at it. Be the Magician in your own life.